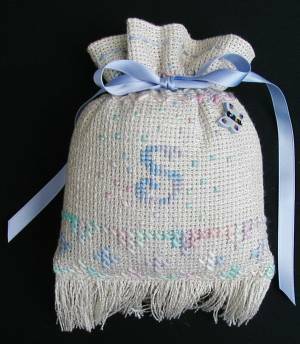 A little sachet with Sofia’s initials, and a nice fringe at the bottom. A chart is given to personalize the piece. It has been designed and stitched for the Kid’s Projects of Caron web site. Fill the sachet with a small piece of scented soap wrapped in batting. Polyester or Silk ribbon: one piece 3/4 in x 29 in. Ceramic Button Collection from Mill Hill: 86318 Lavender Butterfly.